Often times a Performer may request a Song Selection that you may wish to substitute with another selection, possibly another Brand/Series from your SongList. · When Adding a Song Request in the "Add Songs" dialog, you may APPEND a "+" (Plus Sign) to any Song ID and click "Retrieve" to be presented with a list of ALL available listings matching the Title and Artist of the original request. Example: A Performer presents a request for Song# 10290, "My Way" by "Frank Sinatra". 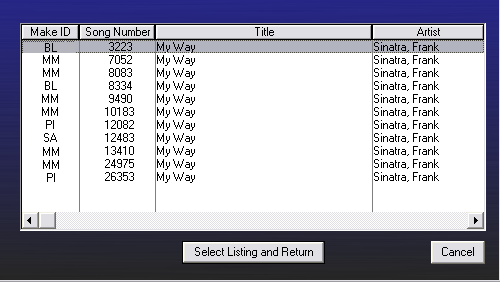 You may quickly view a list of ALL listings for "My Way" by "Frank Sinatra" by simply entering "10290+" and clicking the "Retrieve" button.